What is interesting about this botanic garden is its history: in 1867 Thomas Hanbury, who gave the name to the place, bought the ancient Orengo Palace and the land adjacent to it. Then he decided to transform it in a botanical garden, and his brother, who was a botanist, helped him. 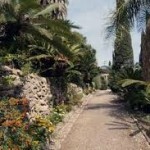 In addition to this, he decided to contact the most brilliant architects in Europe, to give a great look to the garden. He added some embellishments and put fountains and statues and suddenly the place became very well known. During WWII the place was damaged because of the explosions, that is why Hanbury’s daughter-in-law sold it to Italy. She wasn’t able to manage the garden anymore and decited to find someone who could take care it and make it blossom again. Since 2000, the botanic garden, all fixed, is a nature reserve, and visitors can discover so many collections of papyruses, the Australian Wood, aloes, bamboos, plants, and exotic fruits. Following several paths, you can enter to the main gate which is located near the beach, 103 meters above the sea level. Are you ready to discover a small corner of Paradise between two countries?